Master Part General Tab layout has been updated to be more streamlined. The Parts Location Tab has been improved so users have more control and transparency for parts in their location. Users can now create a new location directly on this tab. Or edit an existing location by selecting the pencil icon, updating the text then selecting the save icon. Set a Default Store and a Default Shelf. Each time items are created, receipted in or transferred to a location the default store and shelf will automatically update. Use the grey arrow to update all existing stock in that location to the new store & shelf. Set a Minimum and Maximum Stock Level for each location. The Reorder Report now has the option to search by "Location". Search for either all locations combined or for one specific location. Users can now create an order for a specific division by selecting the correct division from the "With Selected" drop down menu. Line items can be moved to a different purchase order using the Move Orders feature. Note: Only Ordered lines can be moved. 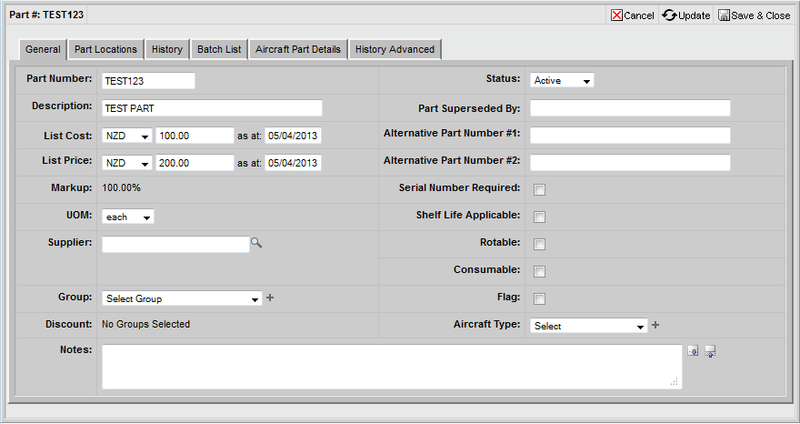 Parts Module search results automatically default to Batch sort order. New option now available to sort by Location by simply clicking on the Location heading. Component History lines now have the option to set a type - Install, Remove or N/A. Install & Remove will update the Component History Card PDF and N/A will not display on the PDF. Retired Maintenance Tracking items that have been incorrectly set to retired can now be set back to flying on the Item General Tab. Clean up historical data by converting incorrect stock items to flying & add them to Aircraft records. Once Set to Flying is selected a quantity adjustment will be automatically performed and a flying item will be created. If parts are allocated to one job and a user tries to issue them to another job via the Parts Issue Screen an error ! message will display to check allocations. Split Items - Transfer (Default Option) will transfer the quantity entered to the new location once "Go" is selected. Split Items - Invoice will give the option to add the quantity entered to a new invoice or to add the quantity entered to an existing invoice. Issue Parts directly to the Invoice Line Items Tab using the new Parts Issue display.